Blood in the urine can sometimes mean different things for men and women. It’s often benign, but in some cases, it can be a symptom of a serious illness. It’s important to get it checked. Hey guys, if a simple visit to the bathroom has you seeing red, don’t ignore it. Blood in your urine (hematuria) can be a sign of a serious problem, so you should see your doctor right away. You may see a range of colors — from pink or slightly dark urine to bright red or cola-colored liquid. You may also see clots, which can come from the prostate, urethra, kidneys or ureters (tubes connecting the kidney to the bladder). 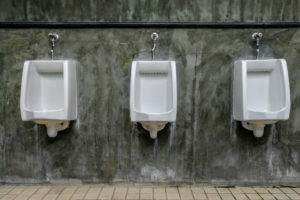 Blood in the urine may show up over a long time, come and go, or happen just once. Many times, doctors don’t find a medical reason for the blood, says urologist Robert Abouassaly, MD. But your doctor will want to rule out serious illnesses and treat less serious ones if possible. Though blood in the urine most often comes from a benign condition, it also can signal bladder or kidney cancer. That’s why Dr. Abouassaly recommends getting to your doctor within a week or two after you first see the blood. “This is because, should it be bladder cancer, a delay in treatment greatly compromises the cure rate,” he says. Are there different causes for men? In some cases, blood in the urine may mean something different for men than for women. Blood may show up from either an enlarged prostate gland or prostate cancer. And, both bladder and kidney cancers are more common in men than in women. For 2018, the American Cancer Society estimates 42,680 new diagnoses of kidney cancer in men and 22,660 in women. For bladder cancer, the society estimates 62,380 new cases among men and 18,810 in women in 2018. The most common cause of bladder cancer is smoking, Dr. Abouassaly says. What tests find causes for blood in the urine? Your urologist will likely examine your upper urinary tract using a scan with dye that gives images from your kidneys to your bladder. This can check for stones, tumors or other abnormalities. He or she will check the lower urinary tract with a scope that looks at the bladder, prostate and urethra. Your doctor also may perform other tests, such as a test for prostate cancer, as needed. Sometimes doctors find that hematuria shows up in routine testing. A sample taken during an annual physical may find blood that isn’t visible. When this happens, your doctor will send the sample to a lab to check for red blood cells. Dr. Abouassaly stresses the importance of getting in to see your physician if you see even a trace of blood in your urine.